Can you plant an Easter lily that you received as a gift outside, thereby saving it and enjoying its flowers long after the holiday has passed? You bet you can, and you will learn the necessary growing information below. Along the way, you will also discover some additional introductory facts, so that you will know exactly what you are ​planting, when it blooms, how best to care for it, and what potential problems you may encounter. Easter Lilies: Symbol of a Season? While Easter lilies are symbolic of their namesake season, it is important not to expect these flowers to bloom for you in early spring. If you want something flowering out in the garden that early, then you should be growing spring bulbs. Even Pasque flower, another plant associated with this holiday, will blossom for you earlier than will the Easter lily, which does not bloom until early July in a northern landscape such as USDA plant hardiness zone 5 (beyond which it may not be reliably cold-hardy, although some list the zones for this plant as 4-8). So how is it that the potted plant you received as a gift was in full bloom for Resurrection Day, but when grown in the yard it does not flower until summer? Well, it is a matter of manipulation, or what the greenhouse trade calls "forcing." We find a similar discrepancy with another holiday favorite, Christmas poinsettias. In each case, the commercial demand for a showy plant that can be marketed for a (in the North, at least) cold-weather holiday has created something of an artificial symbol. The greenhouse operator is always looking ahead. Never is this more so than in the raising of poinsettias and Easter lilies. The summer's heat has barely subsided when poinsettia season begins once again at the nursery. And Easter lily season begins -- for a greenhouse business -- before consumers have even thought about buying a poinsettia for the Christmas holiday. The pros nurse these plants along under glass for months before selling them to the public. Critical to their success is timing everything perfectly, so as to have the plants bloom at just the right time (that is, during the appropriate holiday season). Historically speaking, neither Easter lilies nor Christmas poinsettias have much to do with the holidays with which they are so strongly associated. Neither is native to the Holy Land. 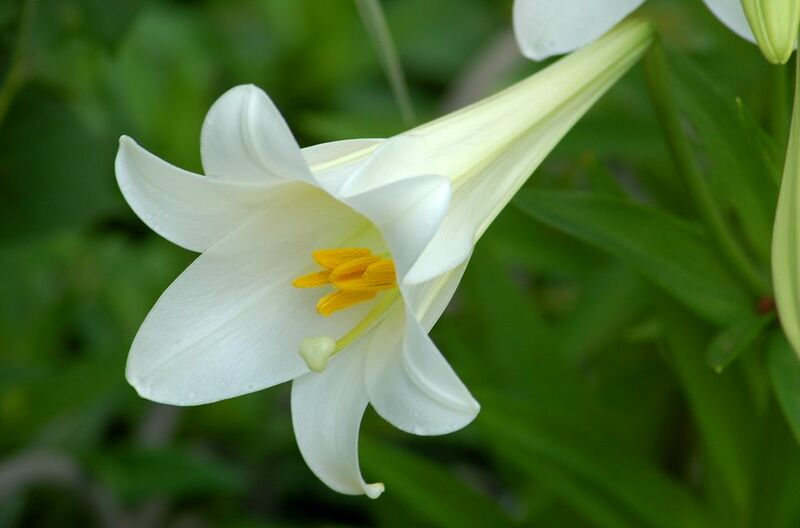 The best case that can be made for the Easter lily as a symbol for the Resurrection is that lilies are mentioned in the Bible, and that white flowers such as Easter lilies have long been used to represent purity. It is not the Easter lily (Lilium longiflorum), however, that is specifically mentioned in the Bible, since Easter lilies traveled west only much later from their native Japan (the Ryukyu Islands). The common plant name given to them at first was "Bermuda lily," because Bermuda was a hot spot for their production in the nursery trade. Be that as it may, you probably wish to save your Easter lily after the holiday by planting it outside, enabling you to enjoy its trumpet-shaped, fragrant flowers for more than just one year. But what plant care will be needed to save it prior to planting it in the garden? What kind of soil will be best for it to grow in outdoors? Does it want sun or shade? What pest problems might stand in your way as you try to save your Easter lily? One master gardener recommends indirect sunlight and a temperature of 60-65 degrees Fahrenheit while you are still caring for Lilium longiflorum as a houseplant. Experts caution us to wait till after danger of frost has passed before planting Easter lily gifts outside: These plants have been raised in a hot greenhouse and would not appreciate being so rudely subjected to cold weather on a whim. If you are impatient and want to get the ball rolling, at least be careful to introduce them to the outdoors gradually, since you risk shocking a plant that has become acclimated to indoor temperatures when you suddenly keep it outside for long periods of time. In fact, for a number of different kinds of plants, a process of acclimating a tender specimen to the outdoors -- known as "hardening off" a plant -- is highly recommended. In spite of all that advice, honestly, some gardeners plant outside immediately after the holiday without adverse effects (a lot will depend on where you live and how cold a spring you are having). Likewise, some instruct using a bulb fertilizer or all-purpose fertilizer at planting time, but many gardeners experience successful growth for a few years simply by providing a soil that drains well and that has been fortified with compost (proper fertilizing may increase your plant's lifespan, however). Pick a spot that receives full sun. After removing your Easter lily from its pot, install it in the ground to the same depth as you had it in the container, water it in, and apply a 3-inch layer of mulch around it. The reason to mulch, especially in this case, goes beyond weed control: Mulch will keep the roots cooler in summer, which this plant likes. Ideally, the bulb, itself should rest about 6 inches underground. If you are growing multiple plants, make sure that you provide enough space between them (1-2 feet). Keep the soil evenly moist, as best you can. Summer's heat will take its toll, but do not worry: It is normal for the leaves to turn brown. Some gardeners cut the plant down to ground level (or nearly to ground level) at this point, promoting new growth later in the season. Again, some go against conventional wisdom here and do nothing when the foliage turns brown -- not because they are mavericks, but because they are trying to save themselves work. Likewise, many gardeners fail to mulch the plant to help it over-winter (it is really a good idea to mulch in regions subject to harsh winters; be sure to remove the mulch in spring). Despite this lack of care, their Easter lilies often re-emerge just fine the following spring, grow to a height of around 3 feet, and produce multiple blossoms in July. If you wish to divide long-established bulbs, do so in late summer or fall (after the foliage has browned). Such division can rejuvenate old plants. Even after the leaves have turned brown, do not forget that a bulb is left behind, underground. This bulb does not like to dry out, so continue to keep the soil evenly moist (not wet, but not dry). In some areas (for example, New England in the U.S.), the red lily leaf beetle (Lilioceris lilii) is a potential problem for the grower of Easter lilies. It also attacks other members of the genus, Lilium (for example 'Fangio' L.A. hybrids and 'Stargazer' lilies') and the genus, Fritillaria. These beetles can defoliate a plant, up to the point even of killing it. If you do not think that you have the time or energy to watch for the beetles daily and pick them off by hand, try spraying neem oil on your plants at the first sign of an infestation. Finally, a warning in saving Easter lilies, especially while keeping them as houseplants: they are poisonous plants and can be deadly to cats prone to nibbling.